The average ticket price for getting into Walt Disney World is just north of $100, making the magic kingdom less than magical for your holiday budget. But instead of packing up the kids, wrangling them onto a plane, and then waiting in line to get into the park, just grab Lego’s new towering Disney Castle and give your family a staycation instead. 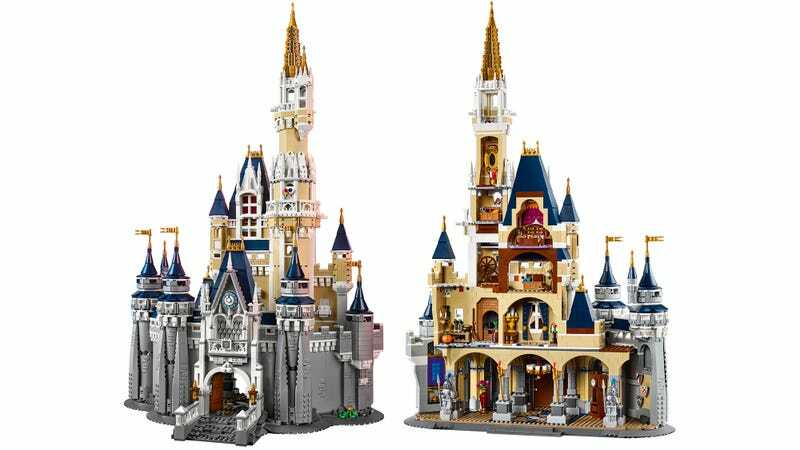 Weighing in at 4,080 pieces, Lego’s new Disney Castle was modeled after the Cinderella Castle that’s visible from almost everywhere inside Walt Disney World. Its spires and fairy tale-inspired architecture are instantly recognizable, and while Lego’s take is no where near as grandiose as the original, this model still stands almost 30-inches tall to the tip of its tallest tower. And while it might be cheaper than the park’s ticket prices and airfare to Orlando, when available Disney’s Castle will still set you back $350 making it as expensive as the Lego Ghostbusters Firehouse HQ set, but with less included pieces. Lego’s Disney Castle does come with five Disney minifigures including Donald and Daisy, Minnie and Mickey (wearing a dapper tuxedo) and Tinkerbell. Lego is obviously positioning this new castle as the perfect place to display all of the Disney minifigures you’ve painstakingly collected. On the outside Lego’s designers have done a fantastic job at recreating all of the subtle details of Walt Disney World’s Cinderella’s Castle, but the set isn’t only meant to be a replica you display on a shelf. Inside it’s packed full of smaller themed rooms featuring nods to well-known Disney movies like Beauty and the Beast, Snow White, Aladdin, Cinderella, Fantasia and more. Like it or not, that tiny candelabra might be the closest thing you’ll ever get to a Lumière minifigure. Does that justify this set’s $350 price tag? Obviously, yes.